We had a lovely day with Evelyn. What I really appreciated was her flexibility. Rather than sticking to a rigid schedule she adjusted on the fly to make our day extra special. She's a lot of fun and we'll definitely book with her again on our trip to Lima next year. We love Evelyn. We want her to come and spent a month with us in our California home. She had a tight itinerary, which we promptly blew up. She improvised, she answered all of our questions, her driver was the proper blend of Peruvian crazy and safe-minded, she took us where the locals hang out, we visited the right sites, she let me read all the descriptive signs at the museums, she introduced us to the right guides, we ate the right food. It was perfect. We wanted to pack her in our suitcase. This was a full day tour from a cruise ship start time 09.00 end 15.30. Evelyn was a great guide throughout and was very helpful with my wife who has mobility issues. Anyone planning this tour from a ship should bear in mind that it involves a lot of walking over a wide variety of different surfaces (wooden, marble and stone steps, cobbled streets etc) and with limited opportunities to stop. That said we had a great time and it is an ideal introduction to Lima. Evelyn does a great job in showing you the highlights of the city. She is very knowledgeable and flexible. Driving in Lima can be a very scary thing for visitors but we felt safe and in good hands at all times. Evelyn was super at pivoting from her planned stops if she saw something out of the ordinary for us to see. This happened a couple times and it gave us even more things to see and learn about. Thank you Evelyn, for sharing your love of Lima with us. We got a really good understanding of the city and what it had to offer. Your knowledge of The history of Lima and Peru was extensive and fascinating, and encouraged us to return. Logistics were smooth and timely - picking us up at out hotel and returning us to our cruise ship. If you have the good fortune to visit Lima with Evelyn, ask her why it's called the City of Kings. It's not what you think. Our 15 March city tour in Lima was outstanding. Our guide was very knowledgeable and very friendly. Our driver easily took my wife and I through out Lima. I recommend both and the half day to all travelers. Evelyn provided excellent historical and culturally information which brought richness to experience. In spite of traffic we were able to easily navigate the city and well as surrounding areas in a safe efficient manner. Our van was very comfortable with a wonderful driver. Lima was a beautiful city where a personal guide is essential. Evelyn met that requirement including lunch in a beautiful restaurant overlooking the Pacific Ocean. Evelyn is an enthusiastic, knowledgeable and congenital guide. Three of us older guys were on a three day tour where she adapted to our quirkinesses enabling us to "go with the flow. " She reads people well and is flexible to their needs. She made us feel connected to the places we visited, her English is excellent and we felt confident when communicating with the locals. Evelyn assured that we had a full day's experience and were treated well. With Evelyn we are left with a very positive view of Peru. Evelyn has been super nice and insightful while taking me around Lima. She has great knowledge about history and current happenings in the city. She is flexible with her time and changes plans if other ideas are presented. She even tried very hard to get me into a restaurant although we were unsuccessful but that is not because she did not try enough. All around a great two days in the city. Also, thanks to her driver, Herardo (spell?). I spent several days with Evelyn and enjoyed every minute of it! She knows not only a lot about the sites which we visited but she also new a lot of nice local restaurants with great food. Moreover, she was very flexible to adjust on the spot the program when asked (of course within the reasonable possibilities). Furthermore, everything was well organized and going very smoothly. Bottom line, great tours in a beautiful country with a great guide! Evelyn was absolutely wonderful! Traveling alone, I wanted a female guide and she was knowledgeable, friendly, and helpful. Her English was great and I encouraged her to change her info from conversational to fluent! She was happy to recommend a hotel suitable for a woman traveling alone as well as a fabulous idea for visiting the archeological site and restaurant for my dinner. Highly recommend her as a guide and her driver was excellent! 5 stars! Excellent tour and organization. Enjoyed Lima 's discovery. Nice....but shorted us by 2 hours. Evelyn was quite flexible with adjusting the tour and did a pretty good job in the order of things. We saw a lot and managed to get in an extra hour or so with and early start. She was ready to go with driver when we got off ship. Evelyn was quite informative. Very pleasant to be with. I would use her again. Evelyn had retained an excellent guide for the Paracas Reserve. He was very informative and pleasant. He also gave information for the Ica region and Huacachino oasis. Only challenge was getting out of the rather plain St Martin port as Princess had no shuttles and guide has to retain one. I have had the privilege to use many guides in many parts of the world and Evelyn is the best I have ever used. She has a love for the Peruvian culture that radiates through to her love of her job. If you are going to travel in Peru I would highly recommend that you book your vacation with Evelyn as your guide. I give her highest marks for her guiding abilities but I am most impressed with the fact that she is a wonderful person. Evelyn is a jewel! 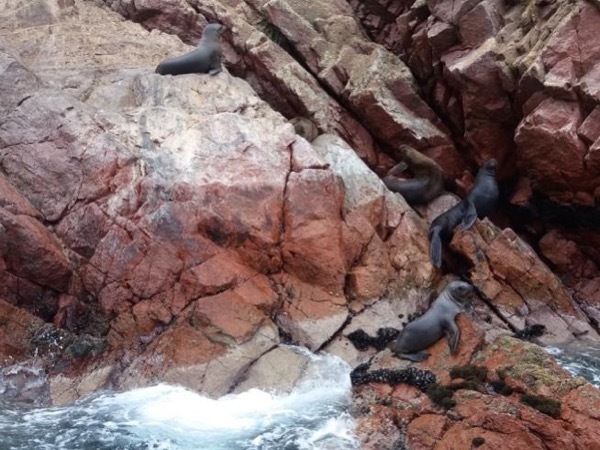 Evelyn did a great job coordinating our visit to the Paracas National Reserve and a trip to the Ballestras Islands. The tour guide who accompanied us was extremely knowledgeable. We were the only group on the ship that was able to see both of the sites in this port. I would recommend Evelyn to all others who are traveling to this area. enjoyed tour very much. Evelyn was very professional and prepared an exiting and interesting day. She and her driver were very solicitous in getting us and all of our baggage to the airport. I would recommend her to all of my friends who plan a visit to Lima. Evelyn is an excellent guide. She made our Lima tour extremely enjoyable. It's also important to note that our cruise ship docked 2 hours late, because the port was fogged in. Even so, she waited for us and made no attempt to abbreviate our day. Thank you for your informative, memorable day. Evelyn was a delightful young lady who was knowledgeable and considerate. We were a party of four senior citizens and had a wonderful time exploring Lima. We also had the pleasure of a wonderful meal. We all heartedly recommend Evelyn for any future trips in this area. TOUR GUIDE RESPONSE: Hi Brendan, Thank you for your words, it was a pleasure to meet and spend the day with a nice persons like you. Big hug and regards :). Evelyn gave us an excellent tour of Lima. She was very professional and adaptable. Despite my husband needing to use a wheelchair for longer walks we felt we had a wonderful tour. Under Evelyn's guidance I travelled by private car from Arica, Chile, to Cartagena de Indias, Columbia. I enjoyed the trip thoroughly and may recommend Evelyn as a guide without reservation. Evelyn prepared an attractive travelling schedule and was able to adapt the plans where necessary. We travelled through Northern Peru during the state of emergency. Thanks to Evelyn's knowledge and contacts we were able to cross the region and reach Ecuador. Evelyn has a pleasant and easy going personality. TOUR GUIDE RESPONSE: Hi Arthur, I appreciate your opinion and is a pleasure to know that you enjoy the trip. Evelyn provided me a great tour customizing it to maximize my experience in Lima. TOUR GUIDE RESPONSE: Thank you for your comment Mathew, it was a pleasure :). Evelyn was a wonderful guide, she showed me the different sites and give me detailed explanation. She was also a great photographer!!! TOUR GUIDE RESPONSE: I appreciate your comments, it was a pleasure to show you part of my city and culture ��. Evelyn & her excellent driver took us on a comprehensive tour of Lima. Her English & knowledge of the area are very good. They were flexible in meeting our requests & diverting around police road blocks. We felt safe wherever they took us. The only drawback about our tour was the van was quite small. We noticed this elsewhere in Peru, however, it made for a tighter ride than we felt was comfortable & almost impossible for the person sitting on the middle to see. Six guests is maximum.